We make pizza a lot, so I was excited when I was paired up The Spiffy Cookie for this month’s Secret Recipe Club. Erin, a constant cooker and baker has 39 pizza recipes. 39!! I thought we loved pizza, but she puts us to shame. I had trouble choosing between her recipes, especially since, like me, her favorite food group is dessert! But the pizza kept calling my name and I just had to make her Spinach Pizza Dough. 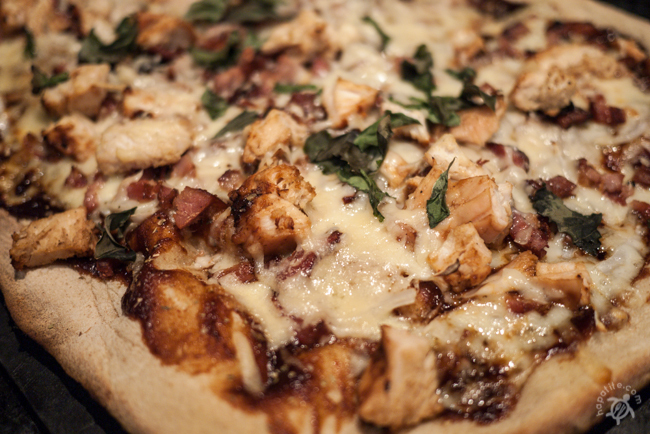 This pizza dough came together quite easily but I didn’t make it right away. Since I made it a day in advance, I put it in the fridge to proof overnight. Since we like our pizza considerably thinner than how Erin prepared hers, this dough actually makes 3 pretty large pizzas. We topped the pizza with some of our favorite toppings: red onions, chianti salami, pesto, sambal, garlic, and some peppercorn cheese. We even used the remaining spinach top top it off. 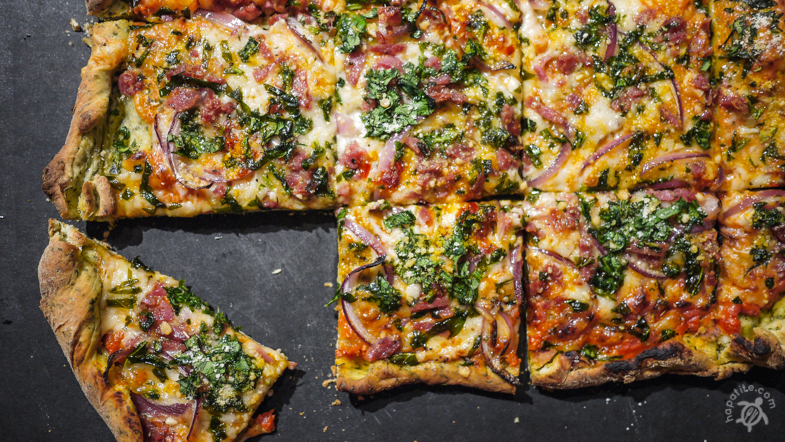 That means this pizza has an entire six ounce bag of spinach in it! If you’re hungry for pizza now, you can check out Erin’s pizza category, including Pizza Quesadilla (which I make all the time now! ), Stromboli, and Christmas Wreath Pizza Ring. My second pair-up with The Secret Recipe Club is Traci from Burnt Apple. 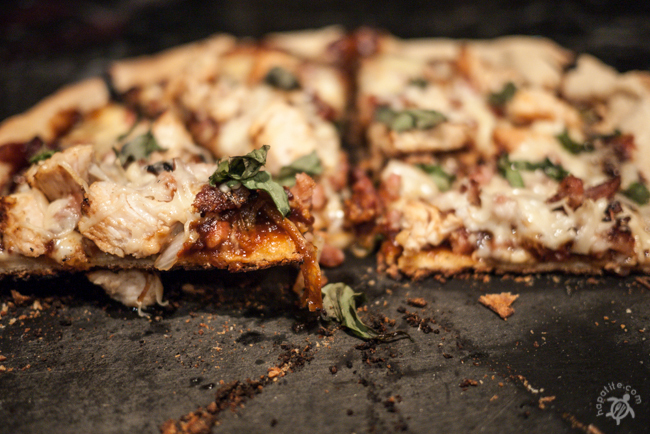 There were a few different recipes I was interested in, particularly the German Chocolate Cake Cookies or Bobby Flay’s German Chocolate Cake, but somehow I steered myself away from the sweets and landed on Grilled BBQ Chicken Pizza. This recipe is incredibly easy and adaptable. It is a great snack to whip up for the game(s) that are starting up this fall! But, like Traci says, choose a barbeque sauce that you like because it is a major player on the palette. I had a pulled pork and bbq pizza yesterday at a local restaurant and the sauce killed the otherwise crunchy crust and gooey cheese.